It’s finally time to upgrade. After about 3 years with my iPhone 4, I’ve finally upgraded to the iPhone 5S. That said … the phone was showing its age. It wasn’t capable of running many of iOS 7’s advanced features, like fingerprint auth, panorama pictures, and Siri. It still looks great — it only had a few minor scratches on it, and it may make for a good backup phone — but I was ready for an update. In most ways, the iPhone 5S is an incremental improvement of the iPhone 4, though it is one heck of an increment. I restored my iPhone 4 backup to the new phone so all my stuff was more or less where I left it. The taller 4″ screen afforded me an extra row of app icons, which I promptly filled. Some have complained that the phone isn’t big enough — but frankly, I hate the bigger phones. If I wanted a tablet, I’d use a tablet. I need a phone that can easily fit into my pocket and require a case of its own (my thoughts on the 3DS XL not withstanding). A screenshot of my iPhone 5. The new phone is noticeably lighter than my iPhone 4, despite being larger. At first this was slightly off-putting — I thought I was going to throw the thing across the room whenever I picked it up — but I’m adjusting. I haven’t tried the camera yet, though I did take a peak at its interface and saw a bunch of new options including slo-mo, square, and panorama. I tried Siri with generally good results. I don’t have a lot of use for hands-free computing, but that hasn’t stopped me from experimenting with it while walking to work. I’ve used it to open apps, get the weather, and find out about upcoming events. The events bit is the most annoying; I have quite a few calendars (home, work, the Mets…) and I really only care about my work calendar. Siri doesn’t seem to know the difference, and is happy to let me know that my first appointment this morning is “Cat Revolution” (a family reminder to give the cats their medicine, and the the feline uprising you might be expecting). The thing I like most about the iPhone 5S is the thing I thought I wouldn’t use: the Touch ID fingerprint scanner. I set it up to unlock my phone, and I have to admit — it’s a lot more convenient than bunching a passcode to unlock your phone. What I like least about my phone isn’t the phone … it’s the earbuds. It maybe that I got used to the firm fit of my Sony earbuds, but I find the iPhone ones to be far too loose. They always seem on the verge of falling out, and if I use the cord remote to trigger Siri I’m almost guaranteeing that one will fall out of my ear. I’ll probably just buy some higher-end Sony earbugs and be done with it. I plan on trying out the 5S’s camera as part of my on-again, off-again Picture-a-Day non-project. I’ve heard nothing but good things about it, and I’m curious if it’s gotten any better at low-light photography. Naturally rumors of iPhone 6 and OS 8 loom like a shadow over all that we do, but I’ve got a plan for that. My wife also has an iPhone 4, and although she’s content with it she too will need to upgrade at some point. If the iPhone 6 is compelling enough, I may get that and give my wife phone. Until such time, I’ll happily enjoy my faster, slightly taller, iPhone. 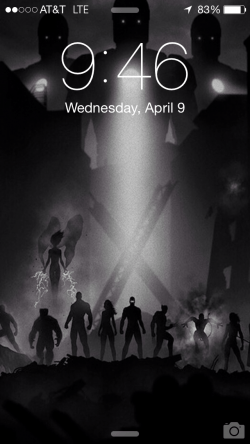 If you’re curious, the background image in my screenshot is by by Marko Manev, who has a bunch of fantastic Marvel-inspired illustrations on his website.